School's out for summer! Instead of returning to television and video games, find beach crafts for kids, edible summer crafts, boy and girl scout crafts, and more with this FREE e-book! Part of the fun of going to the beach is bringing home the smoothest, coolest, and most unique seashells, and while they're great souvenirs, they end up in a shoe box in the corner of your closet. Do something fun with those found seashells, like turning them into Tropical Shell Fish. Beach themed crafts are perfect for the hot months when you need to spend some time out of the sun. Summer craft ideas like this are also fun to do in the winter when you're missing the heat. Transform shells from unusable to fridge-worthy art. Make them into magnets to hang your accomplishments or use them to turn any room into a tropical paradise. 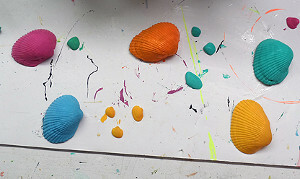 Paint your seashells, choosing smaller shells for tails and fins. Once you have chosen which shells go with which, go ahead and glue them together. Glue googly eyes onto your fish. Who has all those sea shells hanging around from that beach trip that your kids do not want part with and you do not know what to do with them. 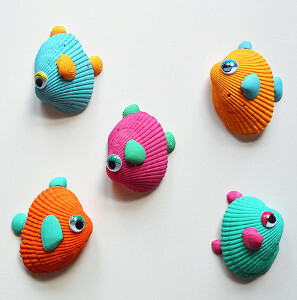 Well here is a real great crafty idea to paint the shells and make them into these cute fish. Add the googly eyes or paint your own and add to a board that you paint (maybe add some bubbles) and you have yourself a great homemade piture created by you. How awesome is that. These are adorable! I love the tropical,colors and the googly eyes have such an expression! You could make these and glue several onto a terra cotta flower pot to embellish it, or on the corner of a picture frame, especially if the photo is of a tropical or beachy vacation! To hang, attach some clear fishline with ultra strong glue that dries clear, but you would have to experiment a but to see how it would hang and the center of gravity so it doesn't flip back or forward, although sideways is OK because it will look like it is diving in or out if the sea! Such fun!